The Sylvan Float tree house is a treehouse in its purest form. Floating above the forest floor this arboreal abode is suspended between a red oak and hickory. 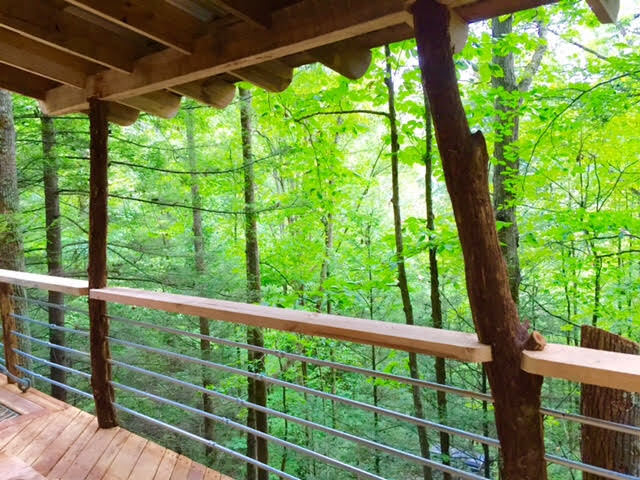 With a full wrap around porch and cozy lofted room, the tree house is designed for two. Great views, fully enclosed room with heat, and a gas stove allow you to relax and feel at home after a day of exploring the gorge. Located five minutes from the martins fork trail head, spectacular hiking and climbing is not far after you leave the canopy and step onto the forest floor. Waking up in the tree tops has a magical effect you have to experience for yourself! 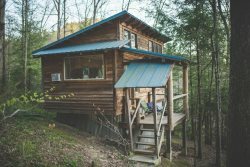 Sylvan Float Treehouse is an off-grid backcountry cabin that does not have running water, but is equipped with a water jug sink, battery-powered lanterns and propane appliances. We hope you’ll enjoy our low-tech approach to a high-quality experience during your stay! Kitchen: The Sylvan Float kitchen has a gas stove, French press coffee pot, cookware, dishware, soap and kitchen linens. Above the sink you’ll find a 5-gallon water dispenser for your cooking and cleaning needs. We supply two 5-gallon jugs of potable water during your stay. Living/Dining: A small kitchen table has seating for two, as does the wrap-around porch. Don’t miss the built-in hammock on the deck! Bathroom: A private composting outhouse is available for our guests at Sylvan. You are also welcome to use our guest shower and bathroom at the RRG Headquarters at any time during your stay. Bedroom: Full-size bed upstairs in the loft. Additional Amenities: Charcoal grill, wall heater, battery powered box fan, suspended hammock in the deck, and a private fire pit.